The nation’s governors held their annual winter meeting Friday through Monday in Washington. A panel on C-SPAN featured a discussion on states’ efforts to combat prescription drug abuse, an issue that took the national stage when Vermont Governor Peter Shumlin devoted January’s state of the state address to the problem. The National Governors Association Health and Human Services Committee’s discussion “Battling an Epidemic: State Efforts to Combat Prescription Drug Abuse” was moderated by chair and Tennessee Republican Bill Haslam. He quickly turned to Vermont Governor Peter Shumlin. The Democrat cited data that since 2000 there has been a 770 percent increase in opiate addiction and a 250 percent increase in heroin use in Vermont. But Shumlin also noted Vermont is not the only state struggling with such statistics. "The problem in Vermont is no worse than it is in the other 49 states. I think one of the difference is that we’re unaccustomed to it in Vermont. Lets be candid about this, when the FDA approved oxycontin, we approved opiates in pill form and the reason we have seen a 750% increase since 2000, well that’s just about when the FDA approved oxycontin." Republican Alabama Governor Robert Bentley, a dermatologist before he was elected to Congress, believes that to begin to solve the problem, efforts must start with educating those who prescribe drugs. “I hate to say this because I am a physician, but it’s a lack of attention on the part of prescribers on how you handle that patient. Do you need to give a patient a hundred lower tab ten? No. There’s just no one that needs that." Governor Bentley is co-chair of the NGA’s Policy Academy on Prescription Drug Abuse. The group worked with seven states to develop a strategic action plan and best practices to deal with prescription drug abuse and its toll on state resources. Academy Co-chair, Colorado Governor John Hickenlooper, a Democrat, says protocols must be established to prevent over-prescribing. "There’s got to be a lot more intentionality about how all our entire medical profession uses pain killers. In addition disposal is a key. We need to ensure that it’s both convenient and cost effective. One of the statistics that I had never heard before was the people abusing prescription drugs, 75% are taking drugs that were prescribed to somebody else." The NGA’s Prescription Drug Abuse Reduction Policy Academy provided technical assistance to seven states to develop abuse prevention action plans, which include monitoring, enforcement, judicial, disposal and education programs. Governor Shumlin says it costs Vermont $1,138 per week to imprison an abuser vs. $123 for weekly treatment, a potential $58,000 annual savings to not lock up an individual. But Shumlin observed changing attitudes is difficult. "We tend to think about heroin addiction and opiate addiction as maybe less sympathetic than we would to other diseases. You know, if your mom and your dad smoked cigarettes and they get cancer we throw everything into it. They may not have made the smartest choice, but we’re with them all the way. We don’t necessarily bring the same compassion and the same approach to this disease, and it is a disease. One of the things governors need to do is start taking about this. We have to do better." Oklahoma Governor Mary Fallin, a Republican, asked for a show of hands from people in the room who have known someone who abused prescription drugs. "There’s a lot of us. And it’s going to take all of us working together. Certainly with the great men and women in our medical profession, in law enforcement, and frankly in our sentencing guidelines. If someone has a true substance abuse problem, Governor Shumlin as you were talking about, getting them that crisis intervention." The NGA will expand its work by launching this spring a second policy academy to help states mobilize effective responses on prescription drug abuse. 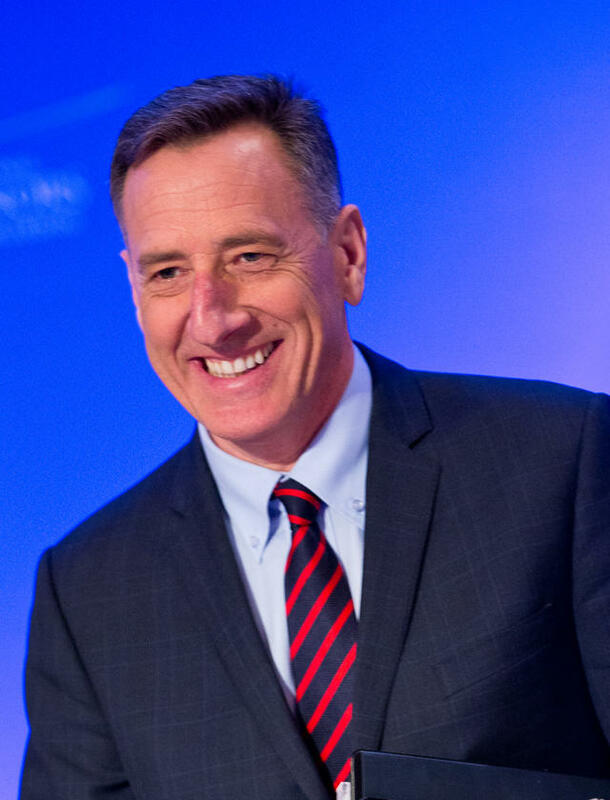 Vermont Governor Peter Shumlin and Nevada Governor Republican Brian Sandoval will co-chair the effort. Audio from the NGA panel discussion is courtesy of C-SPAN. Washington County law enforcement officials are pushing for more community awareness of drug abuse and addiction through more oversight of pharmacies. Washington County District Attorney Tony Jordan says there are a lot of misconceptions about drug abuse and the reality of highly-addictive methamphetamines. In his new book, Clean: Overcoming Addiction and Ending America's Greatest Tragedy, David Sheff shows that addiction is a preventable, treatable disease, not a moral failing. Sheff’s ongoing research and reporting on the science of addiction earned him a place on Time Magazine's list of the World's Most Influential People. Patient advocates and representatives of the medical community in Massachusetts are submitting comments to the state Board of Public Health to address regulations that aim to curb prescription drug abuse. Signed into law by Governor Deval Patrick in 2012, An Act relative to prescription drug diversion, abuse and addiction, requires prescribers of pain killers to enroll in the state’s now-voluntary Prescription Monitoring Program upon renewal of their medical licenses. Currently about 1,700 prescribers in Massachusetts are enrolled in the program. A Massachusetts legislator in Berkshire County is sponsoring a bill that would require health insurers in the state to allow victims of substance abuse greater access to recovery treatment. 4th Berkshire District Representative William “Smitty” Pignatelli, a democrat, is one of four co-sponsors of the so-called healthcare parity bill. The legislation would require health insurance providers in Massachusetts to pay for the continuing treatment of individuals recovering from substance abuse.